Heritage Mennonite Church was founded in 1998 in Millbank, Ontario, Canada. The church joined the Biblical Mennonite Alliance in February 2000. In 2015 the congregation met in the former United Church building in Millbank. The congregation's membership was 13. The church closed in 2017. Thiessen, Richard D. "Heritage Mennonite Church (Millbank, Ontario, Canada)." Global Anabaptist Mennonite Encyclopedia Online. August 2016. Web. 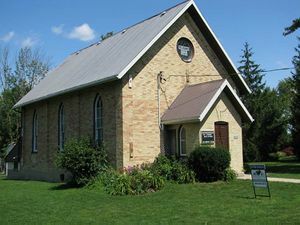 23 Apr 2019. http://gameo.org/index.php?title=Heritage_Mennonite_Church_(Millbank,_Ontario,_Canada)&oldid=156735. Thiessen, Richard D. (August 2016). Heritage Mennonite Church (Millbank, Ontario, Canada). Global Anabaptist Mennonite Encyclopedia Online. Retrieved 23 April 2019, from http://gameo.org/index.php?title=Heritage_Mennonite_Church_(Millbank,_Ontario,_Canada)&oldid=156735. This page was last modified on 10 February 2018, at 12:01.